About a year ago, I started letting you know about the Kickstarter campaign for Badge. Since then, the campaign has fulfilled, I’ve published Badge, promoted it online, and have had events in five different cities to support it. All this has gone about as well as I could’ve hoped, and it’s because of you I was able to do it, so thanks again. By the comments I’ve gotten from many of you about Badge, you’re digging the book too. The next phase of promoting Badge focuses on ebook sales. This is the one sect of the publishing industry that’s growing, and also where readers are most likely to give a new fiction writer the time of day. There are a few good entities out there that will help you advertise your ebook, and one of them requires your book to have a certain number of Amazon reviews to qualify. That’s where you come in. 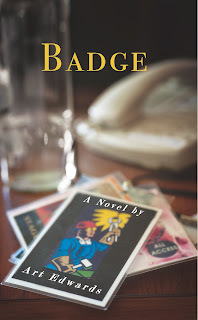 If you’ve read Badge, please take a moment to review it at Amazon. It doesn’t have to be a long review, and you don’t have to be Shakespeare. Just rate Badge, tell what you like about it, what you don’t, and hit return. That’s it. From there, it’s simple to cut and paste your review from Amazon to Badge’s Goodreads page, so you might as well do that too. If I have any hope of not having to Kickstart Novel Four, it falls largely on my ability to find new readers for Badge now, and that might not happen without your help. So thanks again. Badge could end today and be a huge success, but with a little help from my friends, it could keep going too. So I'm at the AWP Conference this past February, at a panel on digital technology and book promotion, when this woman gets up and starts giving away the farm on how to promote your book online. Facebook, Titter, Scribd, Bitly (Bitly? ), she covered everything, and gave step-by-step details on how to make it work for you. I went to ten or so panels during the three-day conference and took nary a note until this one, and I think I wrote every word she said. When she finished, she said her name was Debra Di Blasi, her publishing company was Jaded Ibis Productions, and also, "If you have questions, go ahead and contact me. I'm notorious for giving up too much time to strangers online." While incorporating one of her marketing techniques, I contacted her, and sure enough she ushered me, the complete stranger, through my issue. You know how you remember folks who help you when they absolutely don't have to? Yeah, me too. So I sent a piece to Jaded Ibis for publication, to their blog actually, which is called BLEED, and it popped up this morning. This is a short one about how I learned the most important writing lesson of my life while working at an actuarial firm in San Francisco. What's an actuarial firm? Read to find out. Thanks to Elizabeth Earley for saying yes to this one. ...besides getting ready for my one-day self-publishing seminar at the Attic at the end of this month, where there is still room for you. New Piece on Self-Publishing at Nick Belardes's Site!!! It's a foregone conclusion you're signing up for my self-publishing seminar at the Attic at the end of this month, but I am also publishing essays on writing and self-publishing in April. The first popped up today at fab writer Nick Belardes's site, so after you sign up for the class, go here.